Choosing The Right Keywords Can Increase Your Chances Of Making The Top Pages Of The Search Engines. Posted on 6th July 2011 at 07:00. If your business is looking to make an impact and make to the highest pages of the search engines, then you’ll need to drive traffic to your website. How you choose to do that is up to you: you go down the social media route, or you can try blogging. However, if you want to build up long-term consistent traffic and get top the SERPs, then you’ll have to also give some careful consideration to seo. What all businesses need to do is undertake serious keyword research, even before deciding on names, slogans and mission statements. And why is this? Because keyword-rich names and domains are able to better compete in SERPs. SEO keyword-rich names or conventional brand names – which is better? If you’re starting out in business, which do you think will bring the best long-term benefit for your new enterprise? A brandable name may well stick in the memory, but a keyword-rich one can communicate directly with the nature and spirit of the business itself. If you are new to this, then building a brand name can be difficult, especially if the brand itself has no inherent seo value. Whereas an SEO rich brand name can make your journey to the top of the SERPs a lot quicker and smoother. Before you think of a name for your new enterprise, it’s worth spending some time doing a little keyword research. Obviously you’ll need to have some idea what the site is going to offer in the long run, but this should only guide your choice of keywords. Don’t just limit your seo to site names either. 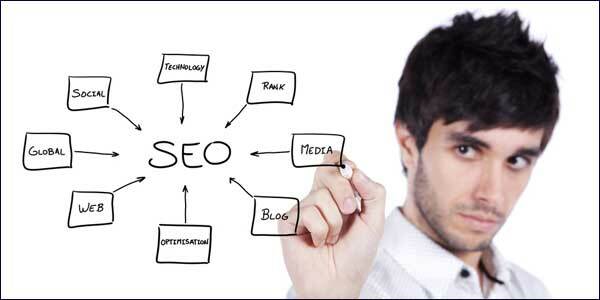 Seo should be carried through to your site tagline too. For example you could choose the tag line ‘the internet marketing strategist’ or alternatively go for ‘online marketing strategist’. Both make sense to readers and give a clear idea of the service you’re offering: the difference is ‘online marketing strategist’ will garner considerably more organic search each month as well as retaining that competitive edge. Are keyword-rich names all they’re cracked up to be? In short, yes they are. Just try searching the internet and you’ll probably be surprised by the number of smaller businesses who make it to the top of the rankings. Size doesn’t necessarily matter for search engine ranking: popularity is more important, and that’s dependent on careful keyword research. So, is that it? Great keywords equal guaranteed success? Of course they won’t, but they’ll certainly help to get your business noticed. Getting a foot on the ladder is one thing, but keeping it there is another. To get a consistent level of organic growth, a business will have to put the work in by marketing itself on social media channels and providing quality content that’s relevant to its users. Oh, and there’s one other small point that shouldn’t be overlooked: whatever product or service you’re offering needs to be good and tick all the boxes, otherwise you’re never going to make any headway. Consumers will only buy quality at the end of the day: the days of pile it high and sell it cheap are definitely numbered, even in a recession. People may well want value, but there’s a limit to how far they’ll compromise their standards. Will Celebrity Endorsements Cut The Mustard For The Newly-Launched MySpace?What You Need To Know About Google+ Part 1.